I made it to Richmond for Worlds. It was an awesome experience. I watched the women's race on Saturday and the men's on Sunday, the forecast called for rain but it held off. Am I looking cool without my car? Richmond did an excellent job, world class. The race was always unpredictable. 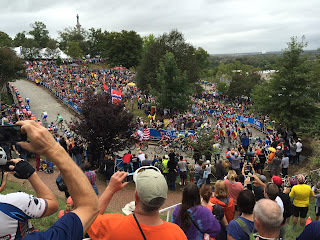 Sagan was totally hidden and exploded on the 23rd street hill in the last lap. Congratulations to Darcy! and a new direction for our club! Club, the big news is that our VP and JLap Road Race Director landed himself a cool full time position as the General Manager and Sports Director of Alberta Biathlon. Congratulations Darcy! So without further typing, I propose we take a slight direction change and position ourselves as the leading bike-athlon club in Alberta. Imagine a road race where you need to stop and shoot stuff in order to keep progressing through the course? The tactics would be a whole new level! You want to be in the peloton, but you just missed exploding the watermelon from 200 yards and have to reload ?!!? Or.. if you are an excellent shot is it worth hitting all the targets right away and going off solo, or do you take a pee break? I'll get some guns from Darcy this weekend and we'll try it out on the Fish Creek Pathways! Who's in! Well that worked! Remaining STC clothing. OK, that was great, we put some great clothing to good use and got to go for beers. We will try to make a beer and wings night more regular so that we all recognize each other without helmets on! I will leave out the bin for one more week if you want to come and grab any of these pieces. Club... beer and wings 'on the club' Wednesday Sept 16th at 8pm at the Toad n' Turtle on Barlow and 27th. We haven't had a beer and wings night for a bit. Tomorrow night is perfect this a ton of the club will be up at DeerFoot Park doing MidWeek Mayhem until about 7:40pm. CX has been cancelled due to standing water in DeerFoot Park. Beer and wings are provided by the club. You get one or two beer if you are driving, and unlimited if you have a DD. Let's all egg Darcy on to eat a pound of the hottest wings they have! Extra STC clothing... donate to the beer fund and grab something. Club... I have a tupperware of STC clothing from years past that is all brand new. It may have been ordered in error, or never picked up, or whatever. It's time for me to pass it on. I have the tupperware at the front of my studio inside Speed Theory Calgary. In it is mainly jerseys, but there are women's bib shorts, and leg warmers, and random stuff. Come in, grab something that works for you, your spouse, or your kids, and leave a donation to the beer fund in the envelope.... and it is yours. I will leave the tupperware there for about a week. Guys, Speed Theory is having their annual Fall Blow-Out sale this Sat. 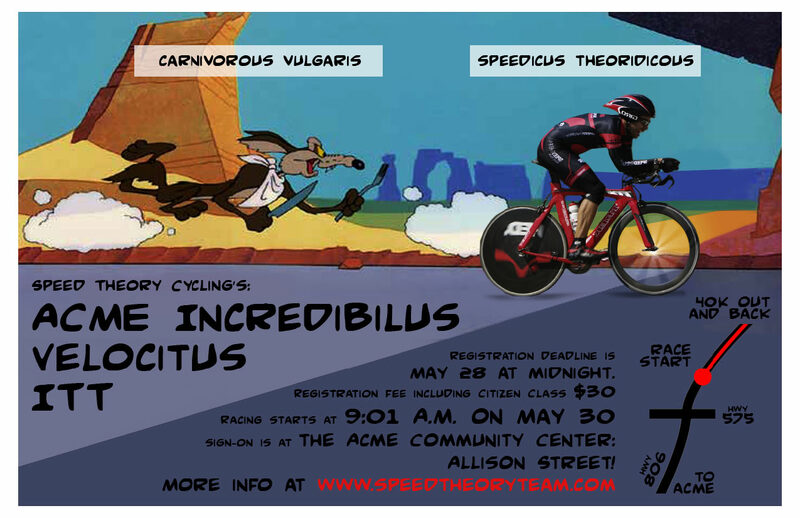 This weekend the Cross racing is in Edmonton, so if you are not up there, then you can ride down to Speed Theory to check out what they have. We will be having a big STC big wrap up party in Mid-November after Cross season and we'll probably do it down at the store, but don't wait to go in there until then! Dennis and I went up to watch the Stage 4 of the Tour of Alberta. We ran into Jenn up there too, which was great to see her enjoying the racing as well. Dennis and I were able to compete in the Marmot Basin Hill Climb Challenge due to dB Performance sponsoring the Tour of Alberta. It was a mass start 11km event that finished through the actual finish line that the pros would be using about 2 hours after we finished. So the pros would race 150km, then hit the hill, while we got to just do the hill! One of the other competitors in the Hill Climb was the Edmonton Oilers Team Captain, Andrew Ferrence. His speed up the hill shows that a pro is a pro. He spends a large portion of his off-season on his bike and it shows! It was a fun event and we appreciated being able to take part in the action, then watch the real riders crush the hill WAY faster than any of us did! After the event, my daughter Jaya and I descended the 11km from the ski hill to the highway. Talk about a view! Saddle up for one of the last road rides of the season. A fund raiser for Shelter Box Canada and an opportunity to hang out and ride your bike. Ride as hard or as easy as you want. There's no official start time but I hope everyone is on the road by 10:00 am. The ride is 107km starting and ending in Rosebud Alberta (about 40 minutes drive time). The ride goes through Drumheller then south to highway 564 and back to Rosebud. The scenery is excellent. Refuel in Drumheller and enjoy a beer in Rosebud after the ride. Late Season STC Cross membership is live. Some STC'ers skip the road season and wait for the Cross season. We have a discounted STC membership for those that just race Midweek Mayhem and the ABA Cross Events. Here is the link to become a late season CX Member.